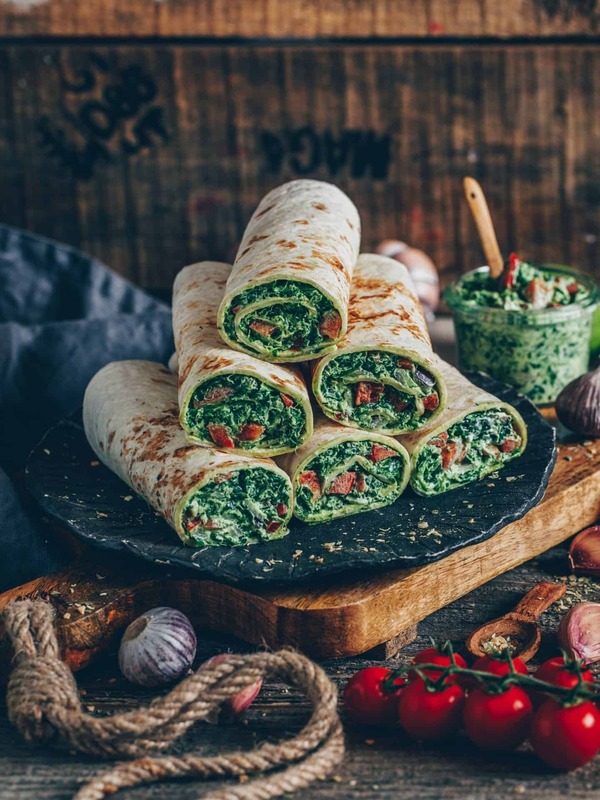 An easy recipe for spinach wraps with pepper and vegan cashew cheese. They are delicious, healthy and perfect to grab and go, for a quick meal or party snack. 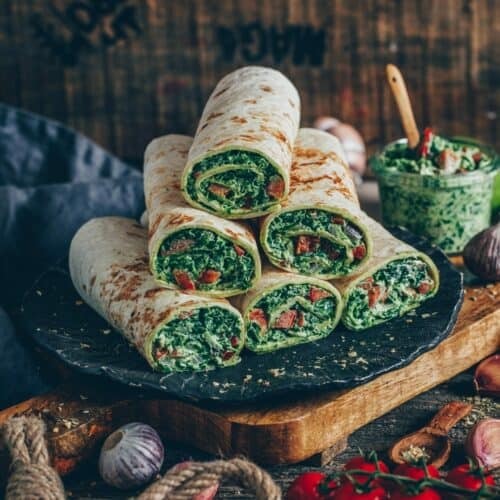 These delicious spinach wraps are ready in around 10 minutes and you only need a few simple ingredients to make them. 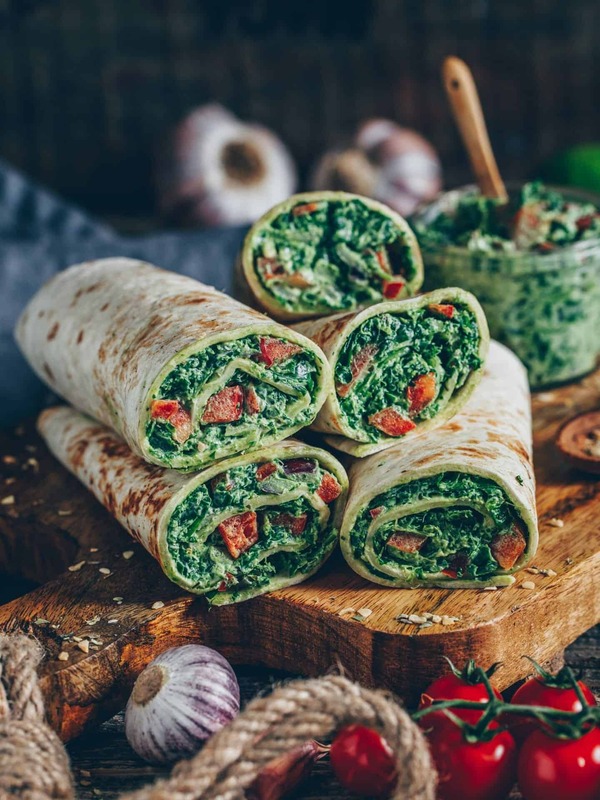 The cashew cheese is easy to make and you can prepare it in advance, so that you can roll up your spinach wraps in less than 5 minutes. Of course, you can also use store-bought plant-based cream cheese or you can make fresh guacamole from avocados, if you don’t want to make cashew cheese. I always like to variate the spreads and sometimes prepare them with hummus. When I choose store-bought vegan cream cheese, I usually prefer the variation with herbs from an organic supermarket. 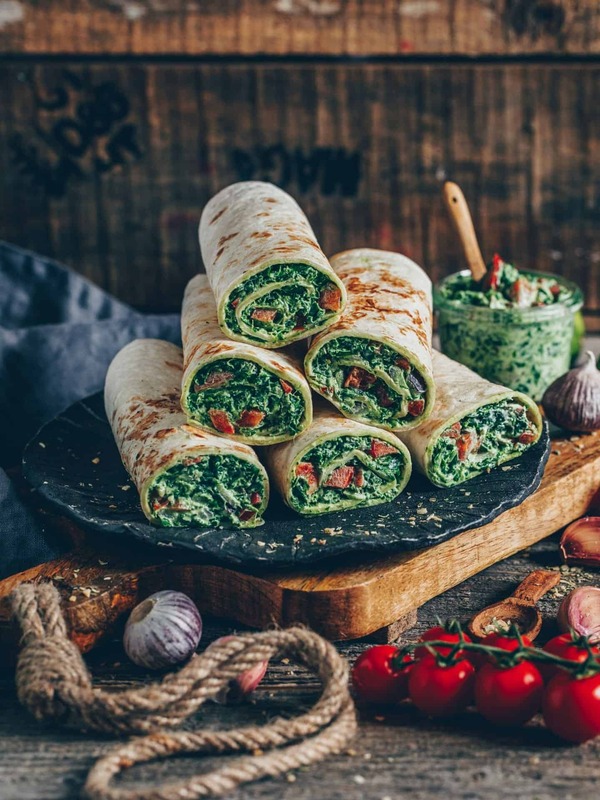 Wraps with fresh spinach – delicious, healthy and rich in vitamins and nutrients! Spinach is a healthy vegetable and in my opinion it’s also very delicious as a side dish. That’s why I use spinach so often in my recipes because it’s literally one of my favorite vegetables. Especially as a filling for different foods, such as empanadas, dumplings and croquettes, it is just perfect. With this recipe, the spinach is just blanched. This means that the spinach is cooked only briefly and then immediately quenched in ice water. The advantage of blanching is that all vitamins and nutrients are preserved. In addition, color and taste are thereby even more intense. 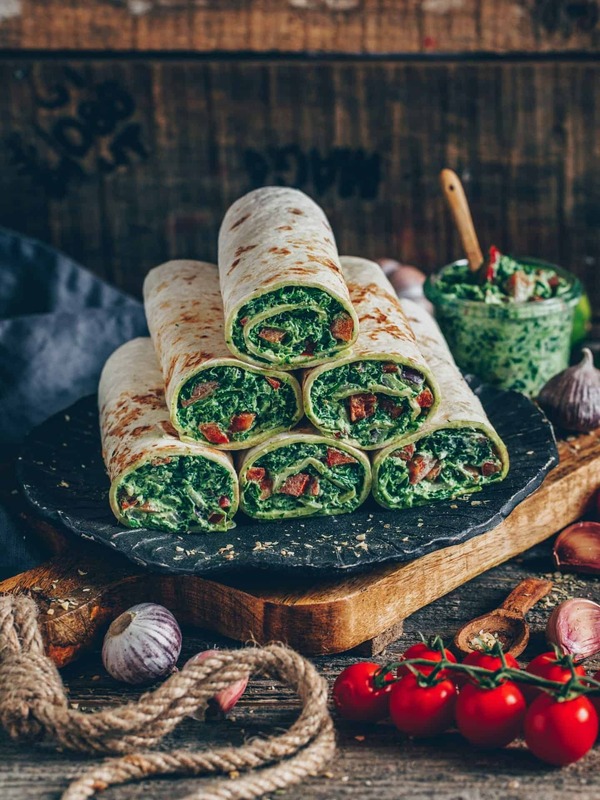 If spinach (or vegetables in general) is cooked for too long, it quickly turns pale and bland and loses all vitamins and nutrients. Very important for delicious wraps are of course the tortillas themselves. They should not be too small and not too hard. Besides, they should not contain any strange ingredients. I prefer to use normal wheat tortillas from an organic store or a regular supermarket, but also gluten-free tortillas are a good choice. Of course, you can also make tortillas yourself, but store-bought tortillas have the advantage that they only have to be heated up briefly in a pan, so that you have less work. When heating them up, please make sure that they do not stay too long in the hot pan, otherwise they will quickly get too dry and can not be rolled up well. If you’re looking for more delicious and healthy (party) snacks with spinach, you could also try my empanadas, dumplings and croquettes. 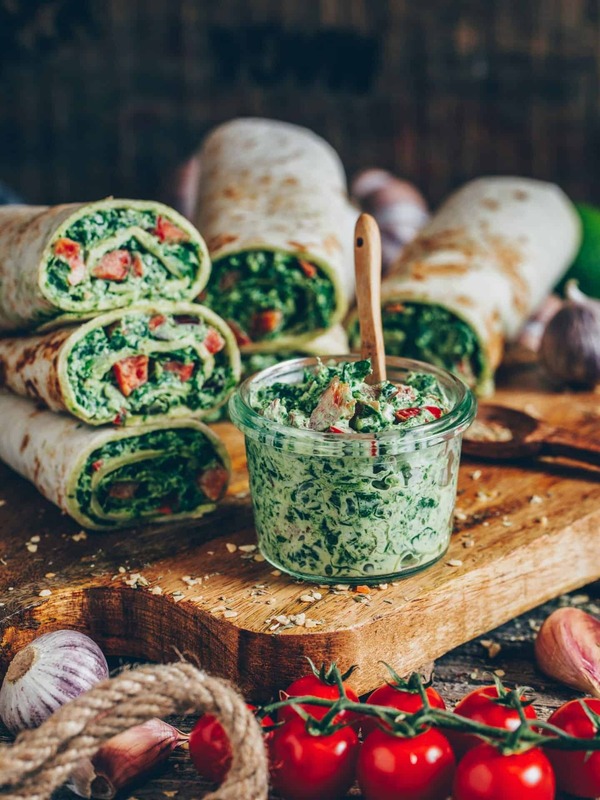 An easy recipe for wraps with spinach, pepper and vegan cashew cheese. They are delicious, healthy and ready in around 10 minutes. You only need a few simple ingredients and you can also prepare them with gluten-free tortillas. 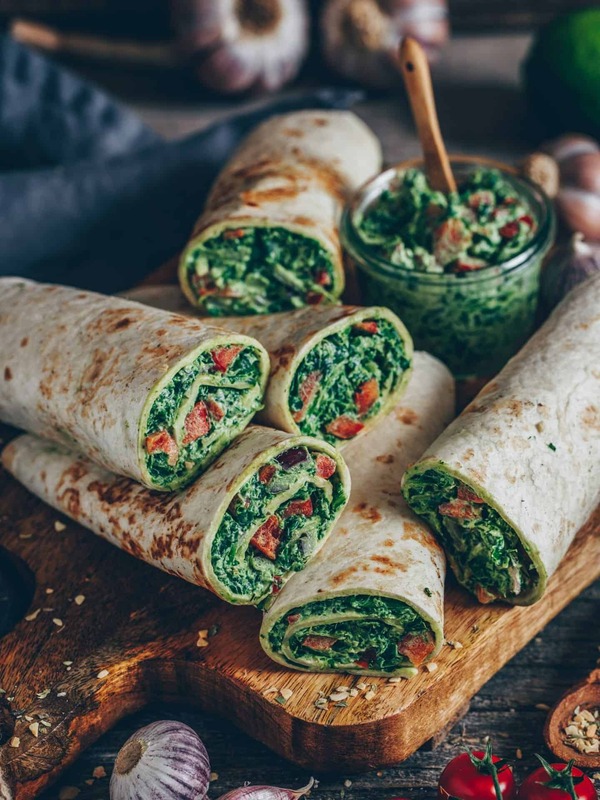 These wraps are perfect to grab and go, for a quick meal or party snack. Soak the cashew nuts for at least 4 hours (or better overnight). Then drain the soaked cashews in a sieve and rinse with cold water. Blend with lemon juice, salt, yeast flakes (and optional a bit of plant-based yoghurt) in the food processor or in the blender. Cook the spinach uncovered in the bubbling water for about 1 minute until it gets bright green. Then immediately scald in prepared ice-water (to stop the cooking process and to keep all vitamins). Then squeeze the spinach well and finely chop. Wash the pepper, cut in half and cut into very fine cubes. Peel the onion and the garlic clove, finely chop and stir with the cashew cheese until smooth. Season with lemon juice, salt and pepper. Then add the spinach and the paprika cubes. Heat up the tortillas wraps in a large pan without oil briefly. 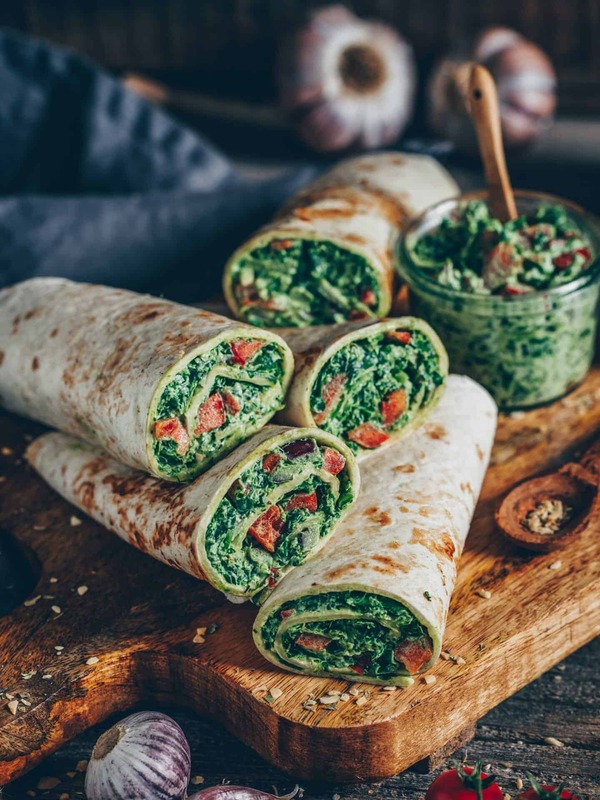 Spread the cashew spinach filling on top and roll them up. Cut them in half and serve. If you prefer to use gluten-free tortillas, I recommend these ones. You can also use frozen spinach. This only needs to be thawed. You do not need to blanch / cook it. For a faster version (without soaking cashew nuts) you can also cook the cashews for just 10 minutes. Instead of homemade cashew cheese, you can also use plant-based (herbal) cream cheese / feta, guacamole or hummus. Haben das Rezept ausprobiert und sind begeistert. Toller Blog. How would this filling stand up in your crepes recipe ? The unsweetened crepes recipe you use for chocolate picture ? 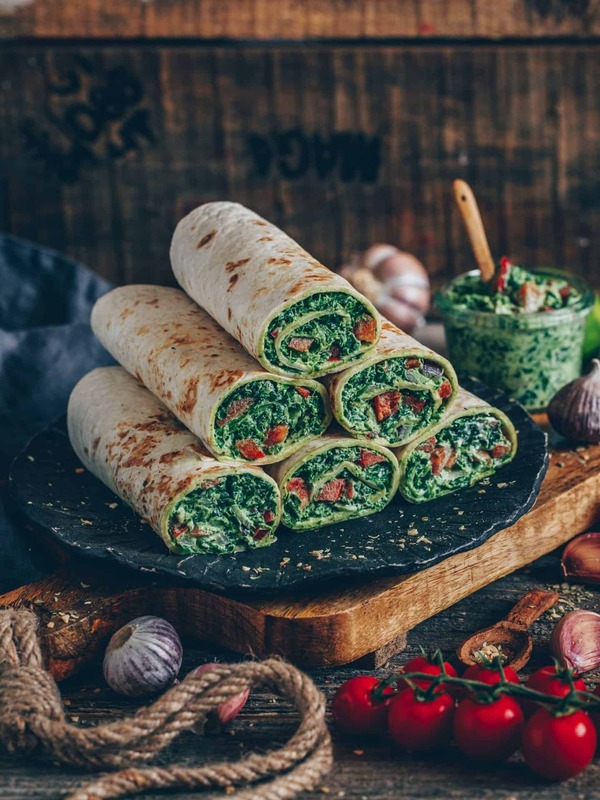 I would like to assemble the crepes with this spinach filling early in day, and serve later at Dinner. I would also like to drizzle some sort of sauce across the top so it looks professional, just like your chocolate or the pink pitta crepes.